Sun, beaches, blue seas, a great seaside promenade and interesting museums to an Italian flair - that's Nice. France's fourth largest city is one of the best-known places at the Côte D'Azur and well-suited for small and big budgets alike. With an abundance of French cuisine, pasta, lots of interesting getaways, its renowned perfume industry and beautiful old city charm, this age-old travel destination never gets boring. 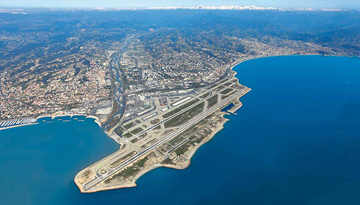 With a choice of departure points on direct flights to Nice during the summer months it is easy to book cheap flights to Nice nowadays and get to enjoy one of the highlights in the French Riviera! 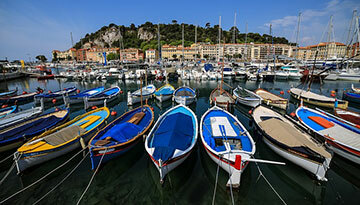 Nice was founded around 350 BC by the Greeks of Massilia (Marseille) and given the name Nikaia. Due to its location, it soon became one of the busiest ports in the area. Later, it merged with the Roman city of Cemenelum, the ruins of which can be viewed in Nice today (Cimiez). Nice later became part of the Italian Duchy of Savoy, from which it still has its distinctly Italian flavor. When the Duchy was annexed by France in 1860, it became part of France and soon after a retreat for Europe's elite. Take advantage of Nice's pedestrian-friendly city center and take a stroll through the picturesque old town beneath the hill. One of the absolute must-sees here is the Place Massena with its beautiful architecture, good eateries and great shopping opportunities. Also on your bucket list should be the Cathedrale de Sainte-Reparate, which will amaze you with its refined architecture and paintings. Throning on the hill top, you will find the castle ruins, from where you will have a great view over the city. If you love museums and art, you should check out the Musee Matisse and the Musee Chagall. For those who want to learn more about the Romans and Gallo-Roman life, we highly recommend the Musee et Site Archeologiques de Cimiez. Round off your day by walking along the Cliff Walk from Coco Beach to Villefranche of along the Promenade des Anglais. Due to its vicinity to Grasse, which is considered the world capital of perfume, you should absolutely take a day trip there from Nice. 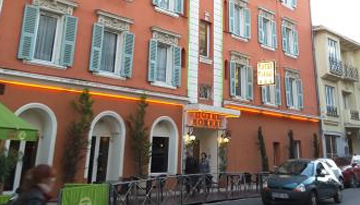 Grasse itself has a beautiful old town and offers several factory tours. Hence, this will absolutely keep you busy for 1-2 days! Another great activity in Nice is taking one of the wine or food tours. Particularly good ratings received the "Nice Wine Tours", which you can book here. Getting around in Nice is a breeze! Get ready for extensive bus and train networks. Also, it is easy to get around on foot or by bike in the city center. If you want to take advantage of summery temperatures, you should travel to Nice between May and early July. That way, you avoid the biggest tourist crowds and take advantage of the cheap flights. Spring and Autumn are less comfortable due to the Mistral winds. And if you don't mind temperatures between 12° and 15°, anytime between December and April is a good time to be in Nice as well! Lufthansa offers cheap flight tickets as £130* from Edinburgh to Nice for a round-trip including taxes. Just stay 2 or 3 nights & save up to 20% at Boreal Hotel Nice - Available all days. Fly from London - Nice & Stay for 7 nights with 3 star accommodation. Room Only.